Two people involved with running Oakland’s DIY concert space Ghost Ship where 36 people died last December in a mass fire have been arrested. Derick Ion Almena, the promoter and “master tenant” who threw illegal concerts like the one on the night of the fire at the warehouse, and Max Harris, believed to be both a tenant of the venue and its creative director, are reportedly each charged with 36 counts of involuntary manslaughter. An overloaded electrical system was found to be to blame for the fire, which broke out during an electronic dance party at the warehouse on December 2 last year. 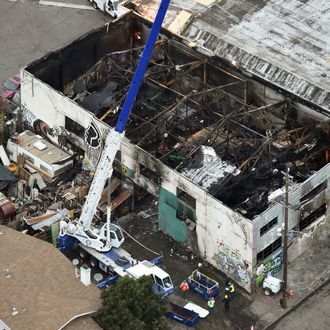 According to CNN, Oakland’s interim director of planning and building discovered that the warehouse hadn’t been inspected in 30 years, and complaints about the building were filed three weeks before the fire. Harris, who was also the doorman the night of the fire, previously claimed he’d notified the building’s owners of the venue’s electrical problems. “[Almena and Harris] knowingly created a fire trap … then filled that area with human beings and now face the consequences of their actions,” the district attorney said in a statement. If convicted on all counts, they each face up to 39 years in prison.